Under the hood, Tavaga is a Robo Investment platform built by experts, that crafts a precise investment portfolio customised to your needs. 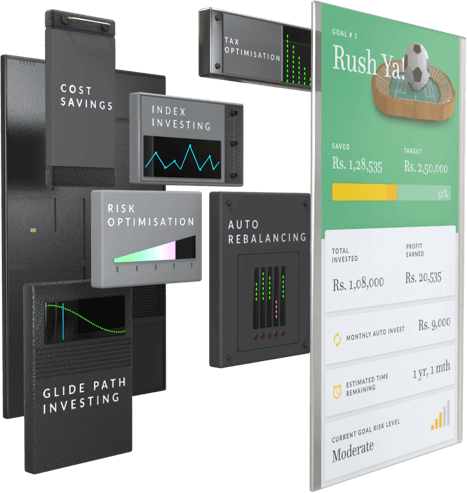 Tavaga’s Robo algorithms automatically manage your investments, and help you reach your goals on time. Index investing is a technique where you invest into funds which track market indices. Market indices like the BSE SENSEX and NSE NIFTY are calculated based on a well researched formula, and their prices are intended to reflect the performance of portions of the economy. The stocks which make up these indices, and their weights in these indices, are determined robotically using a formula. As no human intervention is involved, the cost of running such funds is very low. Compare this to Regular Mutual Funds, where there is a fund management team who gets paid in crores, and has to research thousands of companies to try to select the right stocks. Unfortunately, predicting the future is not easy! Index Investing is not affected by any bad decisions made by fund managers. Globally, Index Investing is growing at a breakneck speed while Regular Mutual Funds have been declining. Index Investing is at the core of ‘Robo Investing’. It removes the human element from the whole investment process, and enables you take advantage of techniques like Tax Optimisation, Glide Path Investing, Automated Rebalancing etc. to enhance the returns on your investments. Profits made on investments are taxable (capital gains tax). However, tax laws allow you to offset these profits with any losses you make on any of your other investments, and pay a tax only on the net amount. Tavaga continuously tracks your portfolio for opportunities to offset your gains, and ensures you capitalise on every opportunity to save tax. Tavaga simply replaces your loss making funds with a similar fund to offset your gains. This technique is called Tax Loss Harvesting, and is widely used in developed countries like the US and UK. Tax Loss Harvesting can add up to 1.5% to your returns every year. Unlike Sec. 80C investments, where your tax savings are limited to about Rs. 46,000, there is no limit on what you can save through Tax Loss Harvesting. This can’t be achieved through Regular Mutual Funds, as exit loads of up to 3% will negate any gains to be made using this technique. Tavaga changes the weights of different assets in your portfolio depending on market conditions, adding up to 1.25% to your returns. For example, if the markets are falling, we reduce equities and buy more government bonds. A Regular Mutual Fund portfolio can’t be rebalanced efficiently, because exit loads of upto 3% will eat away any profit that can be made through rebalancing. Index Investment products like ETF Mutual Funds are much cheaper. A Regular Mutual Funds may cost you up to 2.8%, while a Tavaga portfolio will only cost you about 1-1.2% including your brokerage fee. Every rupee saved on costs adds ten to your returns in the long run. Tavaga constantly tracks your investments and your goals. As you get closer to your goal, Tavaga robotically reduces the amount of money invested into stock funds, and moves it to safer assets like government bonds and gold. This method, called Glide Path Investing, ensures that your money has the opportunity to grow faster with stock funds when your goals are far off, and protects your portfolio from market crashes by moving your money to the safety of government bonds and gold as you get closer to achieving your goal. Some people are okay with their investments riding the market waves for that extra edge, while others prefer more stable earnings at the cost of missing out on the chance of making bigger returns. Tavaga optimises your risk by understanding your ‘Investment Attitude’, and ensures that your portfolio is always aligned with your comfort and preferences.